Students can download the application form and appear for the admission process conducted in the university. The application cost Rs.450 for the general and Rs.350 for the SC/ST candidates. The University conducts entrance examinations to various UG/PG and Diploma courses in the first/second week of June and after evaluation, the University declares the results along with a rank wise merit list. The admission is also conducted based on counseling were the marks of previous 10+2 examination or UG/PG examination are evaluated along with a rank wise merit list for the counseling process. 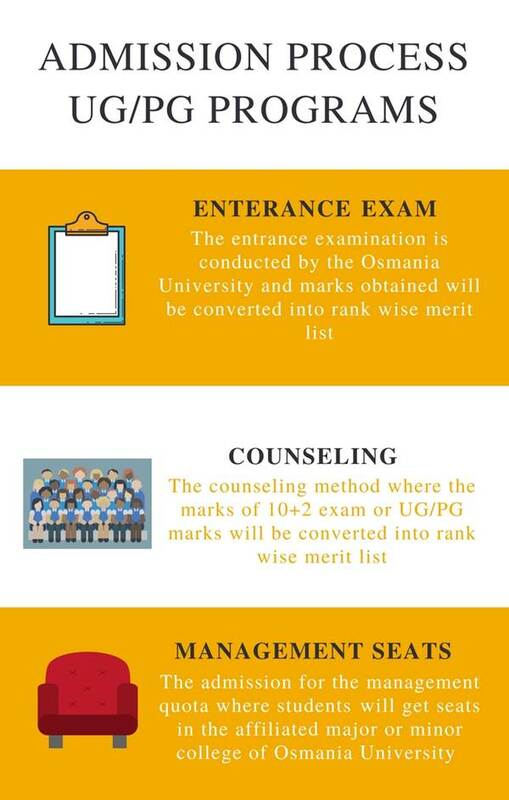 The admission based on the management quota where students will get seats in the affiliated major or minor college of Osmania University. Various common entrance examination marks are also valid for the admission to the university. The candidate who has passed any undergraduate program from a university board are eligible to apply for admission to Osmania University, Hyderabad. The candidate must have passed the relevant undergraduate degree with 40% marks for admission to Osmania University, Hyderabad. Must have studied the language in either Part I or part II in the qualifying examination. The candidate who has passed BCA degree from a college and must have studied mathematics as a mandatory subject in the 10+2 examination are eligible to apply for admission to Osmania University, Hyderabad. The candidate who have studied MA or MSc with the concerned subject with minimum 55% aggregate marks in the examination for admission to Osmania University, Hyderabad. The candidate must have passed 10+2 examination with any subject from a relevant board of education for admission to Osmania University, Hyderabad. The candidate must have passed 10+2 examination with a minimum of 45% marks with business maths and commerce as mandatory subjects in the relevant board of examination to be eligible to apply for admission to Osmania University, Hyderabad. The candidate must have passed 10+2 examination with a minimum of 50% marks with mathematics and science as a mandatory subject for a relevant board of education to apply for admission to Osmania University, Hyderabad. The candidate must have passed the relevant undergraduate program with a minimum of 50% marks from a standard university for admission to Osmania University, Hyderabad. The eligibility criteria for international students: potential entrants are expected to come visit the University foreign region office (UFRO) with all attested documents. 1). B.A results 2).complete photocopy of Passport and visa pages 3). Statement of result. The potential entrants who are not-Indian citizens are exempted from entrance exams. While the potential entrants who are Indian citizens are expected to write exams. Seats are given based on certain percentages acquired. And this percentage vary among departments. The minimum cut off score for international students is 70% for Economics major in Osmania University. Eligibility Conditions: To be Eligible for Admission to Post-Graduate Course in any Academic Year, a candidate must have passed/appeared for the Qualifying Degree Examination and secured the prescribed Minimum Marks in the Subject(s)/course(s)concerned as mentioned in the Brochure and must have qualified at the common Entrance Test conducted by the University in the Academic year for which admission is sought. For administrative reasons, the University may conduct the entrance test before the publication of the results of the qualifying degree examination concerned. But qualifying at the Entrance Test alone does not confer a right of admission into a course. In addition to being qualified at the common Entrance Test, a candidate will be eligible for admission only if he/she passes the qualifying degree examination before the commencement of counseling for admission and secures the prescribed minimum marks in the subject(s)/course(s) concerned. He/She must submit the necessary documents listed under item 7 of this booklet; at the time of counseling. Well, I've applied for MSc mathematics, and written the entrance test.I've given the best of my abilities. ADMISSIONS: The eligible candidates will be admitted to various courses by centralized counseling. The counseling schedule will be informed to the eligible candidates after the declaration of results. The candidates desirous of seeking admission have to attend the counseling in person along with the following original certificates and two sets of xerox copies. Transfer certificate (T.C.) from the Institution where the candidate studied last. If the candidate is pursuing any course during the academic year 2017 - 2018, either regular or correspondence, he/she must submit a proof of admission (certificate issued by the Head of the Institution) and will have to submit the T.C. from the present course within seven (7) days. Otherwise, the admission is deemed to be canceled. An undertaking has to be given by the candidate to this effect. As per the cutoff, it is minimum for the reserved categories and 40%for unreserved categories regarding the mathematics subject. The Eligibility criteria is passing 10+2, which is the qualifying exam to join Bachelors Degree. 10+2 can be from any background. There is no entrance exam required. There will be a limited seats and the person need to take the admission as quickly as the results are out. The better the 10+2 percentage the easy you are into the college. Osmania University is super, it offered very good courses and good faculty everything is simply superb infrastructure is good, friendly atmosphere and cooperative.strictly avoid ragging. Top most university in India many great leaders like KCR and others from this university were achieved the great position. I am Srinivas studying at B.R.Ambedkar college affiliated with Osmania University Hyderabad. Osmania University is one of the most prestigious universities in the country. Eligibility Criteria is the +2 board marks. Bachelor of arts entry is not a very big deal, of course, No cutoffs. No entrance examinations. The eligibility criteria are 70% in U.G and I had written AP ICET 2016 entrance examination and secured 33,000 rank in it, through that I got admission in Viswa Viswani institute of technology and management affiliated to Osmania university. Anyone is eligible for our college if they get good marks in an intermediate min of 50% of marks in IPE. no entrance will be there to join in the college. My course cut off is min off 50% of marks scored in regular intermediate marks. Eligibility by EAMCET exam.The cutoff for civil engineering depends on caste for OC students 0 to 1200, for BC-0 to 4500, for St/SC-0 to 14000.If sports or PHC or NCC category students below 50000 are eligible for this branch. For the B.Sc Chemistry, the candidates must posses 50% minimum in their intermediate. For admission in Osmania University, the OUCET exam is conducted annually. Intermediate pass with good percentage is the criteria for admission to this college. It is very difficult to get admission in the college as more than 90% students can get admission. I wrote an entrance exam called POLYCET to enter into this university of my college. To get admission you should get good rank in the exam. In the exam, the cutoff marks are 110 / 120. Osmania University is a reputed public college in Telangana. You can join the college through EAMCET exam. You should get rank of below 1000 in EAMCET to get seat in osmania University. Degree qualification 50% you need to write ICET examination Cutoff based on your reservations. 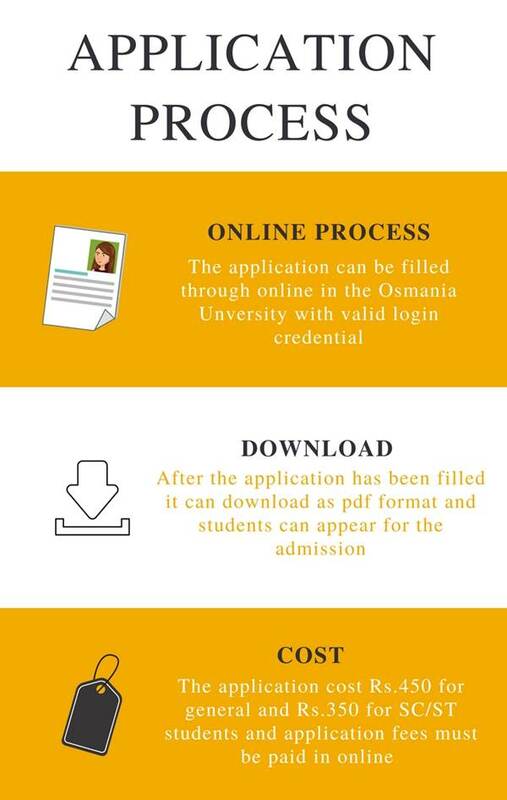 Eligibility criteria for getting into Osmania University is 12th pass. No entrance exams are required. The entrance conducted by Osmania University, Hyderabad was the OUCET exam. Nice college with experience faculty in quality and method of teaching at Osmania University. The entrance exam is APICET, you have to below 1000 rank to get admission in this university. Applicants who are 12th pass are eligible for this course, there are no cut offs mentioned for category students. Admissions at Osmania University are based on the 12th board exam marks. Arts can be perceived. Eligibility criteria are to qualify and clear the OUCET examination. Degree qualification in statistics, past (entrance exam) for MSC statistics, 1/4th. The student has to complete 12th standard and appear in EAMCET exam. I got admission based on quota.